Posted By:Unknown | At:7:16 AM Be the first to comment! Every morning I perused the news to see what's applicable to my readers. 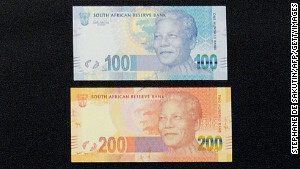 So imagine my surprise and absolute delight when I came across an article on CNN reporting the fact that South Africa was launching new banknotes that would contain the image of Nelson Mandela on them. Now anyone that knows me know that Madiba is a personal hero of mine (as well as many others I already know). So just seeing his name being reference in the title was enough to get me to read the article. Mandela, a Nobel peace laureate, spent 27 years in prison for fighting against oppression of minorities in South Africa. He became the nation's first black president in 1994, four years after he was freed from prison. Minorities! Is CNN honestly suggesting that the black people of South Africa are the minority group? One of the things that made Apartheid extra heinous was the fact that it was a minority group (The Whites) that were oppressing the majority group (The Blacks). So implying that Nelson Mandela went to prison for fighting for minorities is an untruth regardless if it was unintentional or not. This country gets away with calling black people and other people of color minorities because in terms of population we are the minority, but the same cannot be said for the rest of the world. This idea of people of color being of the minority and white people somehow being the majority all over the world is just another example of White Supremacy and how, in the words of Sarah Palin, it rears its ugly head in the most innocent of topics. With the CNN article, the author probably thought he/she was doing a good thing in reporting what was going on in South Africa, but in fact he/she only placed an emphasis on a problem that so many of us are well aware of. White Supremacy/Privilege lives and this article is just another example of it.